Scientists have identified a critical component responsible for converting soundwaves into electrical signals that the brain can process into sound. The discovery of this protein called TMHS may lead to a better understanding of the hearing process and lead to novel treatments for deafness. The ear converts soundwaves into neurological impulses that the brain can process into the sounds that we hear. When soundwaves enter the ear, the eardrum starts vibrating and passes these vibration into the middle ear and is amplified as it goes to the inner ear. These vibrations are then translated into electrical signals that brain synapses can pass on to the brain. There is a distinct shift from a mechanical process from the vibration of the eardrum to an electrical process where the brain synapses transmit these vibrations as electrical impulses. 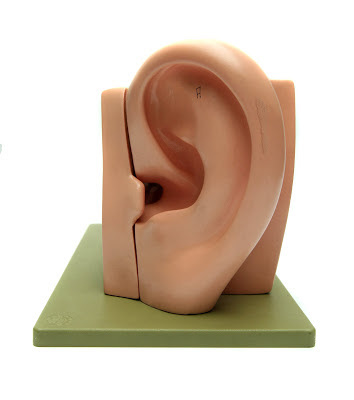 Although the process of hearing is basically understood, the way the ear converts the vibrations caused by the sound waves into electrical impulses is not. By identifying the specific chemical or protein that is responsible for this conversion process, it can open up medical possibilities in improving conditions and therapy for the deaf and hearing impaired. For scientists who study the genetics of hearing and deafness, finding the exact genetic machinery in the inner ear that responds to sound waves and converts them into electrical impulses, the language of the brain, has been something of a holy grail. "Scientists have been trying for decades to identify the proteins that form mechanotransduction channels," said Ulrich Mueller, PhD, a professor in the Department of Cell Biology and director of the Dorris Neuroscience Center at TSRI who led the new study, described in the December 7, 2012 issue of the journal Cell. Not only have the scientists finally found a key protein in this process, but the work also suggests a promising new approach toward gene therapy. In the laboratory, the scientists were able to place functional TMHS into the sensory cells for sound perception of newborn deaf mice, restoring their function. "In some forms of human deafness, there may be a way to stick these genes back in and fix the cells after birth," said Mueller. Inside the cochlea are specialized "hair" cells that have symmetric arrays of extensions known as stereocilia protruding out from their surface. The movement of the fluid inside the cochlea causes the stereocilia to move, and this movement causes proteins known as ion channels to open. The opening of these channels is a signal monitored by sensory neurons surrounding the hair cells, and when those neurons sense some threshold level of stimulation, they fire, communicating electrical signals to the auditory cortex of the brain. 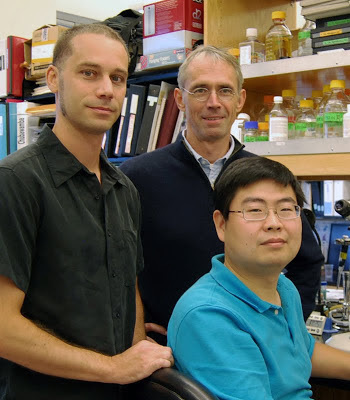 Ulrich Mueller, PhD, (center) isa professor in the Department of Cell Biology,director of the Dorris Neuroscience Center at The Scripps Research Institute, and lead author of the Cell paper;Wei Xiong, PhD, (right) is a senior research associate in the Mueller lab and the paper's first author; Nicolas Grillet, PhD, (left) is a co-author of the Cell paper and a senior research associate in the Mueller lab. But the tip links do more than just maintain the structure of these bundles. They also house some of the machinery crucial for hearing—the proteins that physically receive the force of a sound wave and transduce it into electrical impulses by regulating the activity of ion channels. Previously, Mueller's laboratory identified the molecules that form the tip links, but the ion channels and the molecules that connect the tip link to the ion channels remained elusive. For years, scientists have eagerly sought the exact identity of the proteins responsible for this process, said Mueller. "We can now start to understand how organisms convert mechanical signals to electrical signals, which are the language of the brain,"̈ said Mueller.